Groucho Marx, a reluctant petitioner for the Hollywood Ten, once lamented that the 1947 HUAC hearings into Communist influence in Hollywood had not been used as source material for a Marx Brothers’ film. The brothers’ unique brand of surrealist comedy would, he believed, have found an ideal setting in the question-answer format and the perfect set of foils with the career politicians of HUAC. In a sense, one of the brothers did participate, and there was comedy, but not from him, nor of the intentional kind. Morrie Ryskind, the co-writer on such Marx Brothers’ classics as Animal Crackers and A Night at the Opera, appeared as a witness for the prosecution. Despite, or because of, his ideological resume, Ryskind was labeled a fascist by the unfriendly witnesses. But Ryskind’s politics were difficult to pigeonhole into the Roosevelt-hating, right-wing variety. He had served with several of the Ten in Hollywood unions and defended them against studio-sponsored attacks. A supporter of socialist gubernatorial candidate Upton Sinclair in 1934, Ryskind protested when studio heads demanded donations from him and other employees for the Republican candidate. His activism was not confined to industry matters. He raised money for the Loyalists during the Spanish Civil War and was a lifelong member of the Committee Against Franco. By 1944, however, Ryskind saw a Hollywood producing big-budget defenses of Stalinism: Mission to Moscow (1943) endorsed Vyshinsky’s Trotskyite-Fascist conspiracy thesis promoted during the Soviet Purge Trials; Song of Russia (1944) presented a rosy (and musical) daily life of Kulaks; and although set in America, Watch on the Rhine (1943) endorsed “necessary murders” by having a progressive take a fascist into a garage and execute him. Ryskind took what he learned from union days and helped organize the Hollywood anti-communist group, the Motion Picture Alliance for the Preservation of American Ideals. Three years later, this group provided the bulk of friendly testimony before the Committee. Ryskind’s ability to make comedic targets out of high-society dowagers and opera personnel failed him when testifying about Hollywood Stalinist hypocrisies during the Pact and Grand Alliance period. But the material was really comedy-proof. Not so with the Hollywood Stalinist facing HUAC, who had a golden opportunity to produce laughs. United on a common legal strategy of staying out of jail by pretending to answer committee questions while at the same time refusing to validate Congress’s right to inquire about political affiliations, this potentially surrealist stand, in the hands of anyone else, might have produced laughter from the audience. But save for one quip from Ring Lardner Jr. (“I could answer the question but would hate myself in the morning”), their comments reflected their joyless politics. Ryskind’s serious purpose kept the spirit of Groucho away, but the egocentric drama of the Ten (“This is the beginning of an American Concentration Camp” — Dalton Trumbo; “I am an American and not easy to intimidate, and don’t think I am” — John Howard Lawson) did summon the spirit of one Marx Brothers’ cast member, high-society target Margaret Dumont, if Dumont had attended and absorbed a few cell meetings. Contrast the chest-thumping declaration of principles of the Ten with Groucho’s in an earlier context for the comedian (“I have principles. If you don’t like them, I have others”) and one can see how the screenwriters let the message define the medium. But being Marxist in the Groucho rather than Karl sense would have required the Ten to not take themselves or their politics as seriously. They couldn’t do either — they saw themselves as Leninists leading the Revolution, and principles were not to made light of, but, like art and culture and everything else for them, were weapons. Humor had a way of distracting from the task at hand (recall George Bernard Shaw’s comment of how “much sugar he had to coat his socialist pill with to get audiences to swallow it,” and his colleague’s retort, “Yes, a pity they licked all the sugar off and left the pill”), which in the CPUSA’s case, involved defending the Purge Trials, the Hitler-Stalin Pact, the Soviet invasion of Finland, the Smith Act prosecution of American Troskyites, and the Iron Curtain. Aware of their audience’s powers of focus, which zeroed in on jokes and glittering gowns but not on speeches, communist screenwriters still couldn’t allow themselves to sugar-coat the pill with humor; instead they opted for different flavors, which while bitterer, came more natural to them. Their pill came coated with homicidal anger (“Japs — I just don’t like them” — Dalton Trumbo, Thirty Seconds Over Tokoyo), Grand Alliance patriotism (“All decent Americans are for Tehran,” John Howard Lawson) and antifascist martyrdom (“the stench of the Reichstag fire is in this room,” Dalton Trumbo’s written statement to HUAC). Audiences, in the ’40s as in Shaw’s time, didn’t swallow it. The Ten should have learned the lessons of Charlie Chaplin. 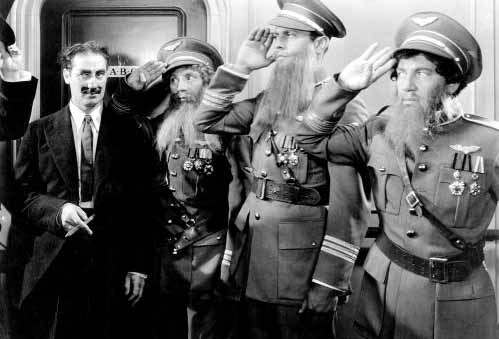 Audiences stayed with his 1940 film The Great Dictator as long as the jokes came, but drifted mentally and some physically when the Tramp gave a humorless and interminable speech at the film’s finale (which, true to form, the CPUSA distributed written copies of, unaccompanied with Chaplin’s genuinely funny jibes at Hitlerism). But learning from the past was not a noted characteristic of Hollywood Communists. Had they been willing, from the vantage point of World War II scriptwriting, to learn from the past, they would have realized Chaplin got the biggest laughs in England, where the Blitz made audiences realize the coping power of humor. This power could have been learned as well had they been willing to take their ideological blinkers off and see a Soviet Union where their cultural counterparts couldn’t or wouldn’t embrace humor, and those who had to live under and die because of the regime had the choice of a genuine belly laugh at the absurdity of it all, or an insane cackle.